For those of you who have been following Uruguay’s journey through the Confederations Cup with us these last few weeks, that journey has come to an end. Unfortunately, it did not end with La Celeste hoisting the championship trophy, but a lot of good things happened in the last two games. In this post, we’ll be reviewing the semi-final game against Brazil, and the third place game against Italy. Those are some tough teams, but Uruguay held their own, and for that I’m proud. Anyway, let’s get on with it. My “How to Watch Sports at the Work” skills were in full effect for this game, a heart-breaking 2-1 loss to the host nation, Brazil. I even skipped a surprise baby shower for one of my coworkers to watch this one. But enough about me being a terrible coworker, let’s talk about the game. This was a huge test for the Uruguayan side. Brazil, although they haven’t been quite as sharp the last few years, are still Brazil. They were also the host nation, and dealing with the social upheaval and turmoil that has been in such unrest in Brazil throughout this tournament, that this game was actually almost postponed at one point. The people of Brazil don’t understand how billions of dollars can be spent to produce a fútbol tournament (and the upcoming World Cup next year), when people are starving less than a mile away from the stadium. A lot of the players used that as motivation, wanting to win the Confederations Cup to make Brazilians love fútbol again. I’m not trying to say that Uruguay had an unfair disadvantage or anything, just that a talented team with proper motivation can do a lot of damage on the pitch. That being said, Uruguay actually played this game very tough. Because they rested just about everyone in their last group stage game against Tahiti, they were fresh. That showed, as they played some of that rough and tough defense they are known for and kept Brazil off the scoreboard until the 41st minute, when Fred (yes, Fred) put one past keeper Fernando Muslera on the rebound of a solid save by the Uruguayan keeper. Fred was one of those home town guys who had spoken out about peace before the match, so it was actually a pretty cool moment. That goal gave the Brazilian side a 1-0 lead heading into the half. It could have just been an equalizer though, if Brazilian keeper Júlio César hadn’t made a very nice save on a Diego Forlán penalty kick earlier in the match. Edinson Cavani, who has been much maligned in my family for seemingly being unable to step up during international play (he is known as one of the best scorers in all of fútbol during league play), made a great move in the box and knocked one past César early in the second half (48th minute) to tie the game at 1. After that, it was all defense for nearly 40 minutes. Neymar, Brazil’s newest star, helped the team take the lead in the 86th minute on a beautiful corner right to the head of Paulinho, who was practically alone on the far side of the net. It was a fantastic ball by the kid, who was called out by the Uruguayan players (and by everyone else, really) for diving too much (he does, and did so during this game too). However, his talent is undeniable, and it shone brightly on that play. Brazil won 2-1, moving onto the finals, and Uruguay was kicked off to the third place game against the Italians. I’m going to be honest, I didn’t watch this game. My lady’s family came to visit for the day, so I spent the early afternoon running a couple of errands (making sure we were stocked with beer and Licor 43, mostly) and spent the rest of the day entertaining. Apparently, I missed one of the better performances by a Uruguayan team in a long time. It’s too bad it came in a 2-2 (3-2 in penalties) loss for our boys. Italy went up early, on a goal by Davide Astori in the 24th minute after a Alessandro Diamanti hit the post with a free kick, but Muslera kept them off the board for the next 49 minutes of game action. In the meantime, Cavani continued his surge, angling a shot into the net in the 58th minute to knot it up. Diamanti to give Italy a 2-1 lead on another free kick in the 73rd minute, but that lead would only last for five minutes, as Cavani equalized again in the 78th. This capped a pretty dominant half for Uruguay, and they took that momentum into the extra time. Uruguay completely dominated Italy in the extra time. This is a big deal. Italy is a great team, and for Uruguay to play that well against them shows what they could be capable of with a little more seasoning and luck in a possible World Cup. Unfortunately, as has been their big problem of late, Uruguay just couldn’t get the ball in the net, and the game went to penalty kicks. Muslera managed to save one of Italy’s penalties, stopping a shot from Mattia De Sciglio, but it was Italian keeper Gianluigi Buffon who really starred during the extra time and shootout. 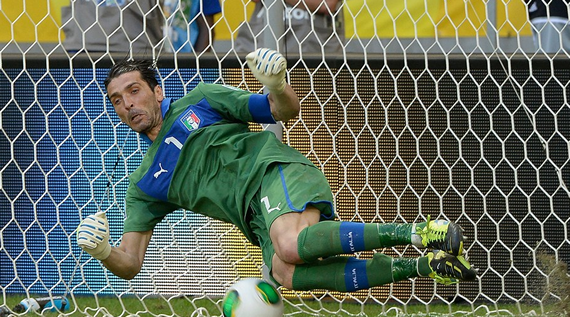 Buffon basically single handedly got Italy to the shootout, as the rest of the Italian side seemed dead tired. In the shootout, he stopped shots by Forlán, Martín Cáceres and Walter Gargano, and that was that. Italy won 3-2, and third place, and Uruguay finished fourth, just like they did in the World Cup. Brazil ended up shocking the world and beating Spain 3-0 in the final too. I didn’t think Uruguay would win this tournament. I thought Spain would run away with it. I was glad to see our squad hold their own against some of the best teams in the world though. It gives me hope for a good showing in the World Cup (if Uruguay manages to qualify, which isn’t a guarantee at this point). We’ll have to see how the rest of 2013 goes, but if Uruguay continues to play like this and gets a little bit luckier, 2014 could be a lot of fun.